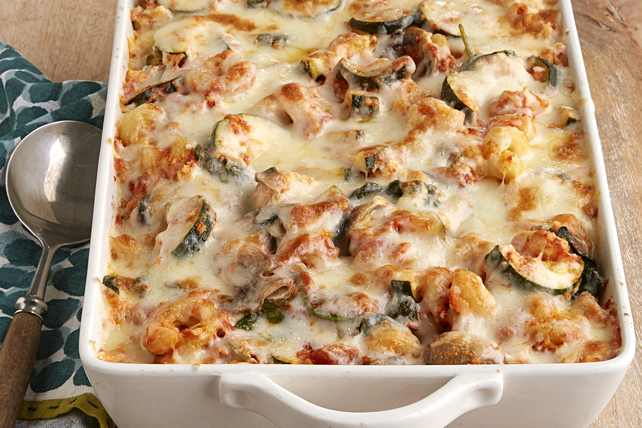 Enjoy Italian fare at home with our Creamy Zucchini & Spinach Pasta Bake! You'll love the taste of this spinach pasta bake and how easy it is to make. Meanwhile, cook and stir onions in large nonstick skillet on medium heat 3 to 4 min. or until softened. Add zucchini and mushrooms; cook 3 to 4 min. or until zucchini is softened, stirring frequently. Add half the spinach; cook 2 to 3 min. or just until wilted. Stir. Repeat with remaining spinach. Remove from heat. Drain pasta. Add to vegetable mixture in skillet along with the pasta sauce, ricotta, Italian seasoning and 1 cup shredded cheese; mix lightly. Spoon into 13x9-inch baking dish sprayed with cooking spray; top with remaining shredded cheese. Bake 20 to 25 min. or until casserole is heated through and shredded cheese is melted.